Your first option is to make the product yourself. If you decide what to sell is something you can make, consider this first. A lot of stores sell individually customized or unique items. Jewelry and crafts are some of the most profitable online niches where sellers can make products themselves. These companies frequently have an artisan model meaning that manufacturers maintain a lot of creative control. Not only can owners keep an eye on their products from start to finish, but they can also be involved with each step along the way. Get prototypes fast and easy. Making it yourself means lower costs of a startup than other types of sourcing. Stay in charge of your product. Never give up control over your brand, quality, product, or how you price your product. Be adaptable and agile. The market is always changing. Stay current by quickly modifying your product when necessary. Become the face of your product. You’ll be known as the maker of your product, which can be great. If you build your email list, you can even branch out to teaching your process—for a price, of course! Might be hard to scale. Having your own brand means you have to back major changes and decisions. Investment of time. It may not cost as much money to start up, but the investment of time needed to come up with a high-quality product is substantial. Limited supply. Based on how much time you have it may be hard to grow in volume. Some of the different businesses that benefit from these standards include fashion designers and natural beauty supply vendors. If you have the skills and desire to develop a unique product, this is the year to go for it! Making your own product is the best way to go when developing a new brand. DIY-ers and other enthusiasts can easily create things like lampwork and bead designs, by purchasing raw materials from wholesale manufacturers or retailers. The best thing about selling online is that jewelry retailers have been popularized around the world. After creating a combination of designs you can easily cater to market demand. The good news is making your own product doesn’t carry many risks. You won’t have to create a minimum number of orders or worry about finding a reliable supplier. If you like, you can just make each product once it’s ordered, leaving very little out of your control in the process. No worrying about inventory here! Margins can be excellent when you make your own products—but remember to put a price on your time. Much of the expense of products you get elsewhere comes from the labor cost. While it might be tempting to think of your labor as free, do an honest dollar-cost evaluation and make sure you’re making a fair wage. If you sell a handmade knitted headband for $30, and it only costs you $8 for the materials, it may seem like a deal. But if it took you three hours to make it, you’re working below minimum wage. Making your own eCommerce products is great when specializing in unique items or specific trends. 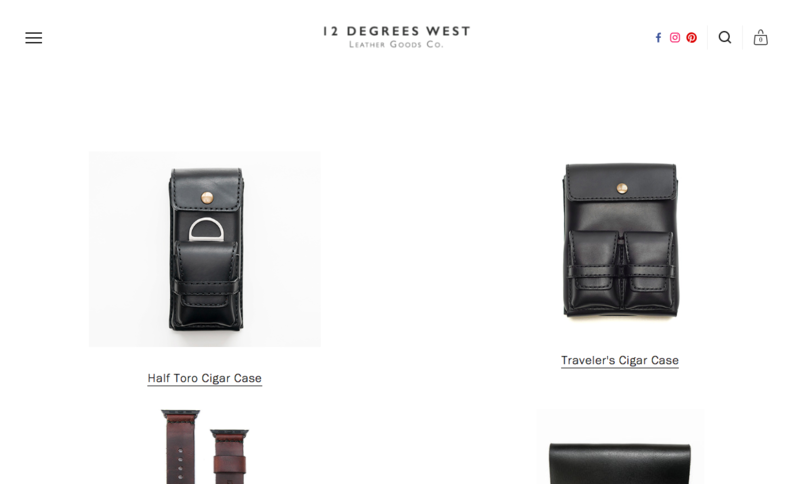 One merchant that executes this well is Fitzy, a chic retailer of handmade leather goods. Instead of targeting the entire leather market they focus exclusively on accessories and are making a killing. Another manufacturer, also in the leather industry, is 12 Degrees West. Handmade products have a special appeal to people who appreciate quality and craftsmanship, and you can usually charge a premium for this type of product. Going the eCommerce route offers a lot of flexibility and options—even if you don’t want to design and make your products from scratch. Let’s say you have an idea, but don’t want to endure the hassle of making each item yourself. Working with someone else to help you manufacture products is a great way to free up your time on the backend. Lowest cost per unit. Manufacturing gives you greater margins on your products because they have the lowest cost per unit. You’ll spend less on merchandise this route. Brand control. It also helps you build a brand based on your product. You can shape your product in any way you want without being constrained. Quality control. This method also gives you power that wholesale purchasing doesn’t– the ability to control the quality of your product. You can be scammed. Overseas manufacturers can rip you off, a risk that could bring any business to its knees. Minimum order quantities. Manufacturing your product could cost you an arm and a leg. This can be crippling for many startups short on cash. Time to get up and running. It takes time to get your product out there. Manufacturing is a long and tedious process that goes through various stages such as prototyping and sampling before the product is released to the market. The problem can be bigger if your manufacturer is overseas where there are language and cultural barrier. Manufacturing is really the only way to go if you’re creating a new product en masse. If you’re designing a new gadget or device, you’ll need to have someone else create it. Manufacturing is also a good option if you’ve already tested your product well and have full confidence that it will sell. You’ll need to put a lot of time and money upfront before you can look at strategies to make your first sale. Manufacturing involves a good amount of risk. Buying product upfront without any assurance that you will find buyers is the most significant risk you can take. Manufacturers have a minimum order quantity (MOQ) most of the time, and it is important to discuss this with them to know how what the minimum order will be ahead of time. If you negotiate correctly you can minimize these risks over time. Ultimately it is up to you whether manufacturing will be the right solution for your business model or not. You’ll also need to keep a close eye on margins. Manufacturing your product(s) comes with varying margins based on the manufacturer, the product and the volume of each order you are receiving. In an average manufacturing shipment, your products can give you the most exceptional margins compared to other methods such as drop shipping or purchasing wholesale. Gymshark is one brand that makes the manufacturer model work incredibly well. They sell fitness clothing, accessories, and related apparel online while sourcing directly from manufacturers. This allows the company to sell unique varieties they’ve designed exclusively for their customers. To stay on the right track with a profitable online business, you need the lowest possible product acquisition cost. One way to accomplish this is to order items wholesale. This is a strategy where you buy the items in bulk, and resell them at a higher price online. This is the strategy most brick-and-mortar retailers use. Chains like Target or Safeway buy cereal, paper towels, or clothes from wholesalers and mark them up. Getting goods wholesale means that you buy products in large quantities. The goods are usually purchased at low prices so that you can sell them at retail prices to your customers. Save time and hassle. Since the product is already manufactured, you can focus on running your business. Proven product. Getting a product from the wholesaler means that it is not a brand new concept necessarily. It could be less risky working with products the market already wants. Brand recognition. Wholesale goods have a brand that can be recognized. Another reason why there is a lower risk is that the goods have already been tried and tested. There could be a higher chance that customers will accept it without a doubt. Lots of competition. When you buy wholesale products, anyone could follow along. For example, has a lot of products that could be purchased and redistributed by wholesalers. This may be a challenge when it comes to differentiating. High competition means low margins. Margins may be restricted on certain items if there are a lot of them in the marketplace. Lots of overhead. Like the manufacturer model, there is a lot of overhead when it comes to wholesale distribution. Wholesale products are usually the fastest to start selling since the product already exists—you just need to buy it. It’s also good if you’re planning on selling specific brands, or want to sell a variety of products. It’d be difficult to manufacture all the individual pieces needed for a home brewery kit, but you could purchase everything wholesale quickly. This also makes it easier to write a business plan for your eCommerce store, since your products don’t need a development process to get started. Risks are pretty low with wholesale products. Because the products are already proven, you also have a low risk of getting stuck with tons of inventory. The big risk, though, is your competition. When you buy wholesale products, you don’t have any differentiating factors, which can make it difficult to stay afloat when others enter the same business. Wholesale purchasing is one the most profitable ways to acquire your products, after manufacturing. Nothing is guaranteed, but margins around 50% are fairly common. This is because you’ll be placing large minimum order quantities, which gives you the pricing benefits of scale. A great example of a company that does wholesale well is The Elephant Pants. By creating a unique angle—clothing that helps save the elephants—they’ve made it hard for competitors to take their market share. Dropshipping refers to the process of handling sales and connecting with customers for products you may not necessarily own. You may consider drop shipping as a way of doing online businesses for the least overhead and capital investments. It is based on the principle that a third party is involved in the delivery of goods to the client. If you are a drop shipper, you are responsible for handling shipping and delivery of goods that you may never actually come in contact with. The main difference between a drop shipper and a retailer is that the drop shipper does not own any of the stock. If a client has made a purchase, a third party has to get goods packaged and delivered for the drop shipper. If you want to become a dropshipper, the only thing you must do is set up an online store and be in a position to manage the payment methods. 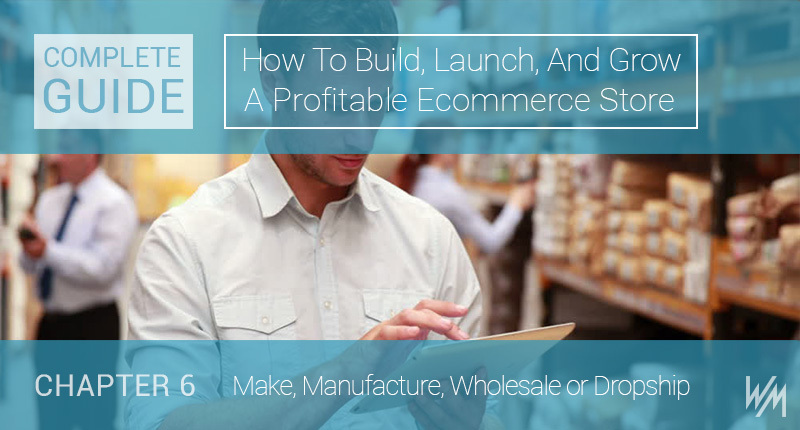 There are a lot of ways for you to succeed when it comes to setting up your eCommerce store. If you have a low budget for starting up, dropship is an awesome option to build your starting point. It can help you offer a lot of products so that you can find out what customers like. This is also a great strategy for understanding the basics of setting up a store on different platforms. Since there are so many different ways that manufacturers and retailers can work together, it is critical to understand where your business is going and what long-term goals you may have. It may become more profitable to include these methods of product development over time. Even if it is unaffordable to work with overseas product developers or manufacturers at first, over time it might be possible. It can make a substantial impact on the way that your eCommerce business grows. Less capital. Dropshipping is probably one of the easiest and cheapest ways to operate an online business. You can be in a position to begin this type of venture without necessarily investing much money in the startup phases. This is possible because you do not have to purchase goods unless there is an order by a customer and the products or goods have already been paid for. Convenience. This is one of the main reasons why it is the preferred model for numerous online businesses. When you are in the e-commerce sector, you do not have to worry about your location. You can conduct your business anywhere in the world as long as there is a reliable shipper for you to work with. Wide variety of products. Dropshippers can offer the most products to their customers. The benefit is you don’t have to purchase goods and instead customers can select from a wider range of products. This means that you have the liberty to give your customers a variety of options every time. If they need it, all you have to do is purchase the goods and ship them over when needed. Low margins. Many people have already ventured into this business model, making it a competitive space. With lots of vendors competing for the same audiences, prices may be so low that you cannot compete with them. High competition. Competition from both dropship partners and other vendors in this sector is a challenge because it is so easy to start. Everyone seems to have been in the mix for some time. Competitors may be offering “attractive” prices to their customers and may have a lead time before you even define target customers. You may need to branch out and try different channels to get sales. Dropshipping is for eCommerce store owners who want a hands-off experience with little risk or time involved. It’s also the fastest and cheapest way to get started by far. If you want to try things out without risking much time or money, this may be the way to go. There are virtually no risks to starting a dropshipping store since the dropshipper covers all the risks—like orders, inventory, and fulfillment—for you. There are huge risks for your long-term profitability, however. The low margins mean you’ll struggle to acquire new customers since you won’t have much of a marketing budget. And it’s also the easiest business for someone to replicate, so you need to keep a careful eye on your competition. Because you need to pay someone else for the dropshipping work, such as fulfilling the orders and managing inventory, your margins are slim. Expect around 20% for the products you sell when dropshipping. 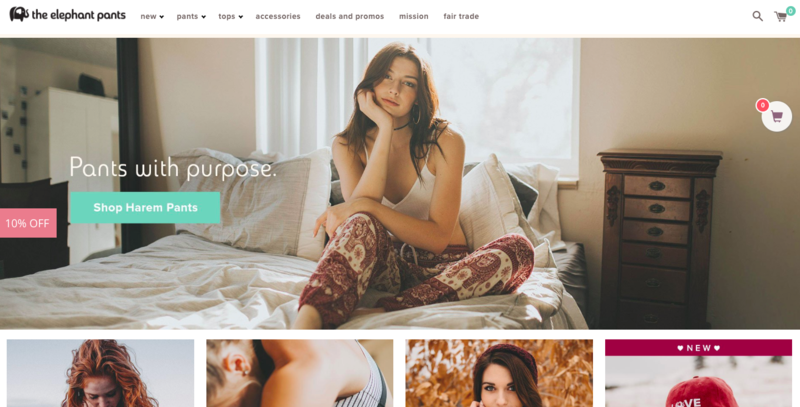 One company that has executed the dropship model well is Maison du Roi, an up-and-coming fashion retailer for clothing and accessories. 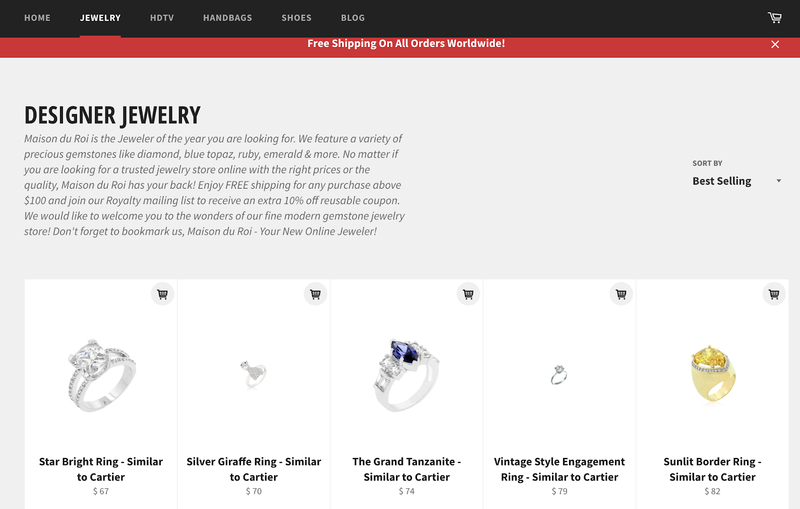 Dropshipping allows them to provide the jewelry quickly, without spending time managing inventory or handling customer service. Choosing your product can be one of the most difficult decisions to make with your eCommerce store. But with some helpful strategies, you can succeed with every product you stock. Second, look into working with a manufacturer. This can be costly and difficult but often leads to the highest profit margins. Next, consider wholesale. Buying the product outright can be simpler than having it created, but you’ll need to make sure you won’t be undercut by someone else. Finally, consider dropshipping. It’s by far the most expensive option on the list, but it can be an easy and hassle-free option if you’re willing to take the price cut. How will you get your product?